During the 18th century Europe experienced a real archeological boom, especially for everything related to the relics of ancient Rome. After the major excavations of Pompeii and Herculaneum as well as the excavations of other decayed ruins of the Roman Empire the world learnt about the architectural wonders and artistic beauty of ancient Roman buildings and monuments. 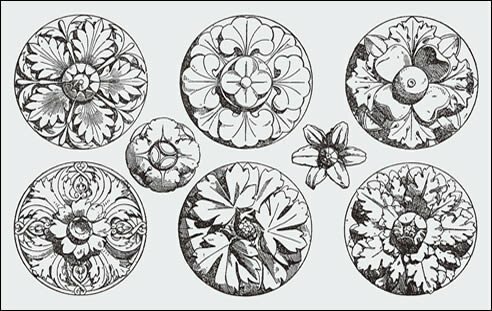 In 1781, Carlo Antonini published his research on the carved rosettes that typically adorned interior ceilings of these ancient buildings. In the study the author described 100 ornamental rosettes, found on the ruins of the homes of Rome and towns nearby. The publication featured copperplate engravings of each rosette. The carved decorations were of remarkable beauty and the engravings demonstrated not only the frontal view of the stone carving but also a cross-section. A great range of architectural remains and statuary are now exhibited in the National Museum in Rome’s Campidoglio. Most of them have traces of brightly colored pigment, so experts consider that many buildings and statues of Imperial Rome were decorated in blue, green, red and earth colors popular among the ancient Romans. These days replicas of the Roman rosettes decorate the modern buildings and homes. They also serve as a great interior décor. Some people use the rosettes to line a hallway, a staircase or just get a group of rosettes decorate the wall above a low table or sofa.